The Ouch! 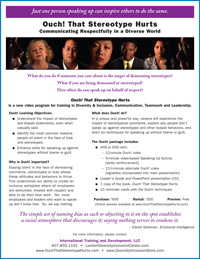 video series provides a powerful D&I toolkit for addressing bias and stereotypes. All three training programs (Ouch! That Stereotype Hurts; Ouch! Your Silence Hurts; and Ouch! 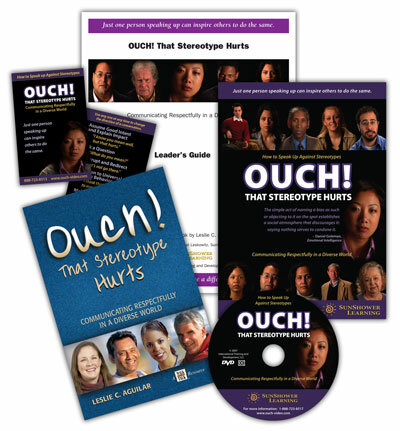 That Stereotype Hurts Online Learning Experience) are based on Leslie’s Aguilar’s best-selling video training program, Ouch! That Stereotype Hurts. Staying silent in the face of demeaning comments, stereotypes or bias allows these attitudes and behaviors to thrive. This undermines our ability to create an inclusive workplace where all employees are welcomed, treated with respect and able to do their best work. Yet, most employees and leaders who want to speak up don’t know how. So, we say nothing. Continue the Ouch! That Stereotype Hurts conversation with Ouch! Your Silence Hurts. Ouch! Your Silence Hurts will inspire conversations beyond the training room! Ouch! Your Silence Hurts delves more deeply into the pivotal role of the bystander and how you and others can become active allies. This complete training program will inspire passive bystanders to become active allies. 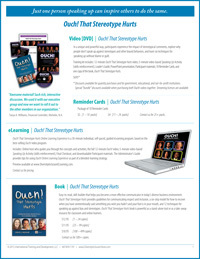 A 30-minute individual, self-paced, guided eLearning program. 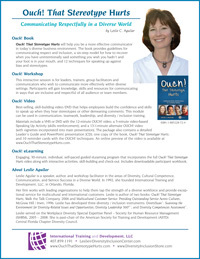 This powerful program enables learners to explore communication skills for promoting inclusion and respect in the workplace.